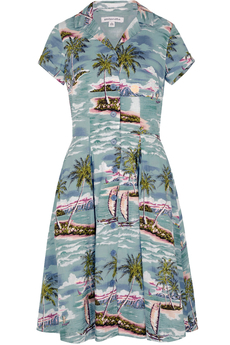 Kate Paradise Island Shirt-dress is an effortless style for sunny days. The full button-down fastening creates a slightly looser fit in the bodice with a tailored notched collar, bust darts to fit and short sleeves. Has A-line skirt with concealed side pockets and box pleats. Made from a lightweight cotton which is soft-to-touch. Is fully lined and is approx. 100cm in length. New Summer 2019 Collection. Composition: 100% Cotton. Lining: 100% Cotton.